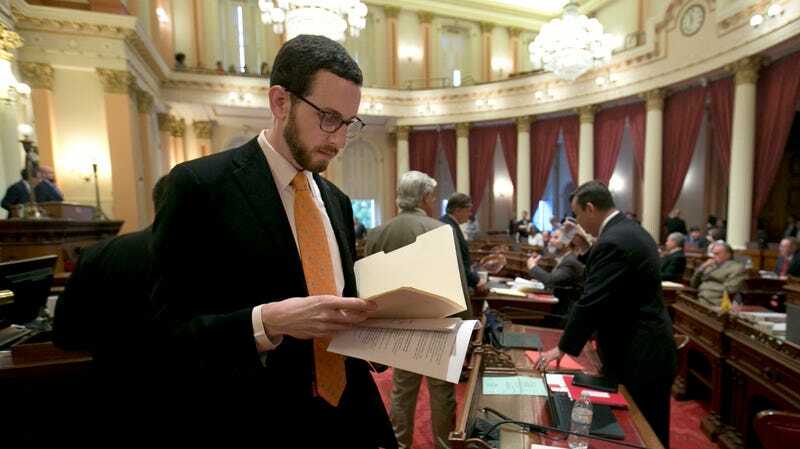 Sen. Scott Wiener, D-San Francisco, introduced California’s net neutrality legislation earlier this year. A California bill that would hold internet service providers accountable for violating net neutrality has passed the State Senate, meaning it is halfway to becoming law. The legislation, first introduced in January, is considered by digital rights advocates to be the “gold standard” of state-level laws aiming to offset the FCC’s decision last year to repeal net neutrality nationwide. Introduced by California State Sen. Scott Weiner, a Democrat representing San Francisco and parts of San Mateo County, SB 822 passed the Senate in a 23-12 vote. The bill will now be taken up by the State Assembly, which is overwhelmingly controlled by Democrats. A vote is expected there by September. The bill largely mirrors the protections offered by the Obama administration’s 2015 Open Internet Order, revoked by the Federal Communications Commission’s Republican majority in December. SB 822 would prevent internet service providers (ISPs) from censoring or throttling website and services online, while also prohibiting the providers from charging businesses exorbitant fees their ensure content is delivered to customers at higher speeds. Further, the bill would prohibit what’s known as “zero rating,” the practice of which ISPs picking and choosing which websites and services consumers can visit without impacting their data limits. The federal net neutrality rules will become officially void on June 11, according to the FCC. SB 822 was fiercely opposed by the nation’s leading ISPs, top lobbyists for whom spent at least $26.3 million last year to have the FCC rules thrown out. By March, ISP lobbyists had dumped nearly $1 million in attempts to block or water down the legislation, according to state records. The FCC’s decision remains highly contested, with a slew of lawsuits filed by digital rights groups and multiple trade organizations representing some of the nation’s largest internet companies, in addition to smaller wireless providers that say net neutrality fosters competition. Roughly two weeks ago, the U.S. Senate voted 52-47 to reject the FCC’s decision under the Congressional Review Act (CRA). The matter is now being taken up in the House where it faces an uphill battle. The measure will require support from a majority of House lawmakers (218) before a vote will be called, whereas in the Senate only 30 signatures were required.